I love strawberries. The hubs brought home a box of real North Carolina Strawberries. So what do I do? 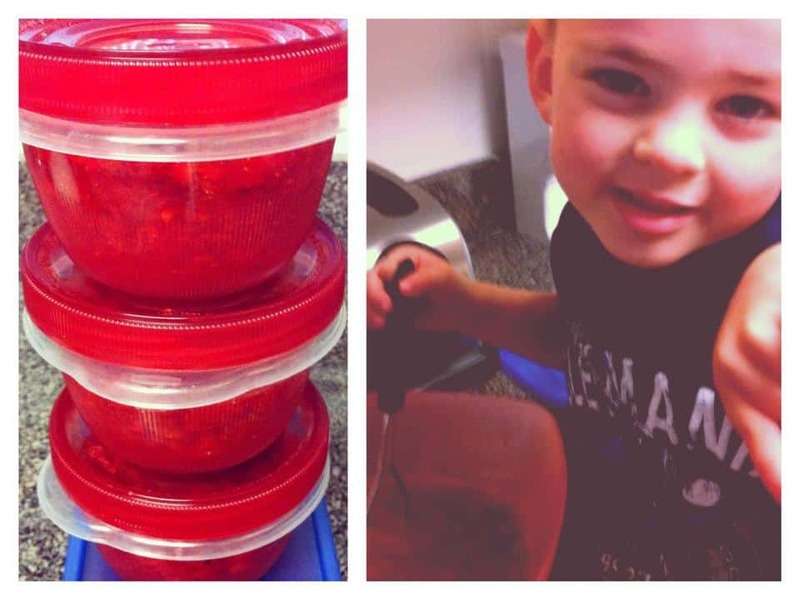 Make strawberry jam! It was easy. We just got the recipe in a Pectin Box. Delicious! How I changed it: Kept it the same. Things I may do differently next time: I wouldn’t mash the strawberries as much so that it was a little chunker. Wash and dry the freezer-safe containers and set aside. With a potato masher or in a food processor, mash the berries, leaving some chunks. Measure out 2 c. of berries into a large bowl. Stir in exactly 4 c. sugar and allow to stand for 10 minutes. While the berries and sugar are co-mingling, whisk the pectin into 3/4 c. water in a small saucepan. Stirring constantly, bring to a boil over high heat and stir for 1 minute. Remove from heat and stir into strawberry mixture for 3 minutes or until sugar is almost entirely dissolved. Ladle the jam into the prepared containers, leaving about 1/2″ at the top for expansion. Top with lids and allow to stand for 24 hours at room temperature. Refrigerate for up to 3 weeks or freeze for 1 year. Makes 5 8-oz. containers.